The genus Vaccinium comprises about 400 species, many of them found in tropical mountains. 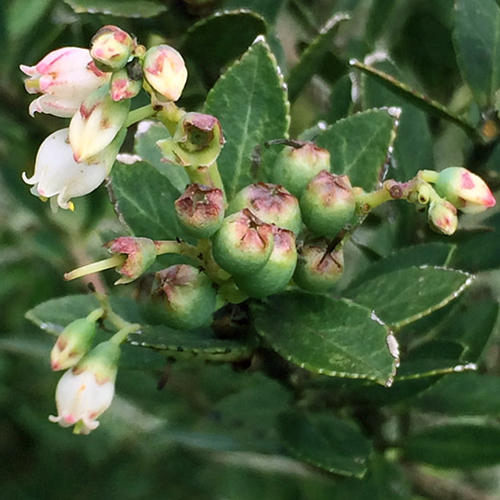 Vaccinium meridionale Swartz is a native Colombian plant that belongs to the family Ericaceae. This plant grows in the Andean region. 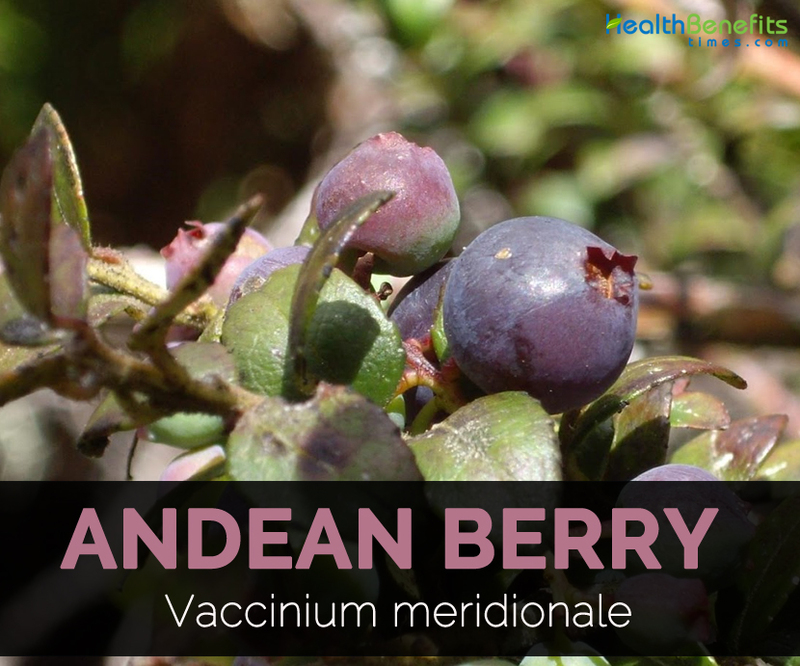 The fruit of Vaccinium meridionale, Andean berry, has six stages of maturity based on the color of the skin, ranging from green (unripe) to dark purple (mature). The right conditions for Andean berry growth are: altitude between 2000 and 3800 meters above sea level, rainfall between 958 and 1350 mm per annum, temperature from 13.5 to 22.3 °C, solar radiation between 16.1 and 21.3 MJ/m2, soil pH between 4.4 and 5.4, and a soil rich in organic, loose, porous material with an inclination of 50%. The soil for planting seeds consists of a mixture of soil, sand, and commercial mycorrhizal products, in a ratio of 7.5:1.5:1 respectively. The fruit’s levels of antioxidant activity and anthocyanins are comparable or superior to those of many other Vaccinium berries. Therefore this fruit possesses great marketing potential as a nutraceutical food or as fresh fruit; it is a source of anthocyanins, natural antioxidants, and natural colors, and is an ingredient in the development of functional foods (beverages, yogurt, ice cream, jams), products for skin care and protection, and food additives to inhibit the oxidation of fats and oils. These features make this berry a promising product for the development of the Andean agribusiness. The Andean berry is produced by a small shrub that reaches 4 m high and 5 m in diameter, usually very branched with rounded crown, and with leaves and new branches of maroon and pale green. The leaves are toothed with short petioles and stomata on the under sides. The ﬂowers are small, with different shades from white to pink. Eight to ﬁfteen fruits are produced in terminal clusters or are axillary, especially in the branches located toward the middle and upper bush. The fruit is a drupe with berry trend, characterized by a ligniﬁed endocarp that comes from the inner epidermis of the carpels, differentiated into a layer of disintegrating sclereids in ripe fruit. The exocarp is formed from the extracarpellar tissues surrounding the ovary. 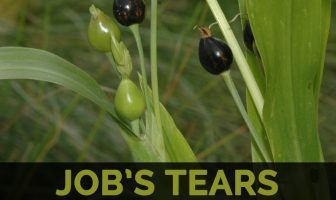 The outer skin has a thick cuticle and is grooved, while the collen chymatous subepidermal tissue and the leaf are abundant in anthocyanins. The mesocarp differs from mesophyll carpels, and it constitutes, together with the placenta, the edible part of the fruit, rich in sugars, tannins, and sclereids. The size of the fruit varies from 5 to 20 mm and the weight from 2.6 to 6.8 g. The fruit is green at first stage which darkens to purple in final stage. 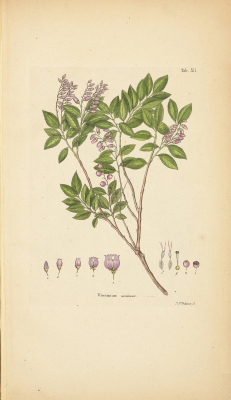 The species of Vaccinium are being recognized as rich in phenolic compounds, particularly anthocyanins, whose phenolic structure is responsible for their antioxidant activity: that is, their ability to scavenge reactive species (ROS and RNS) such as superoxide, singlet oxygen, hydrogen peroxide, and hydroxyl radical. The previous study concluded that a yogurt supplemented with an Andean berry syrup and Lactobacillus casei probiotic is a nutraceutical and nutritive food that is beneﬁcial to human health, attributable to their antioxidant effect and probiotic content. In addition, human consumption is recommended during the ﬁrst 8 days following its preparation, because during this period there occurs the highest microbiological count, the best antioxidant activity, and the lowest proportion of physic chemical changes. The anthocyanins are ﬂavonoids widely distributed and of great importance for their chemopreventive activity against colorectal cancer observed in vitro and in vivo studies. In addition, it is possible that cytotoxic and antiproliferative effects against SW480 and SW620 cells may be produced by the synergistic action of anthocyanins with other important compounds present in V. meridionale berry, such as phenolic acids which comprises 30% of dietary polyphenols. The mechanisms involved in the antiproliferative activity of Andean berry polyphenols in aqueous extract are also unknown, but it may be surmised that it occurs by cell-cycle arrest and apoptosis, as mentioned. To answer this question we are performing additional studies in our laboratory to investigate whether cell-cycle arrest and apoptosis may be involved in V. meridionale berry induced cell death of colon tumor primary and metastatic cells. In isolated rat hearts, the treatment with fermented non-alcoholic extract of Andean berry improved the postischemic recovery of systolic and diastolic myocardial function by increasing left ventricular developed pressure when the coronary ﬂow was restored. At the same time, a reduction of left ventricular end-diastolic pressure was observed during reperfusion in hearts treated with the fermented non-alcoholic extract of Andean berry; this indicates that myocardial diastolic stiffness was minor in the presence of the extract. On the other hand, this group found that thiobarbituric acid reactive substances (TBARS) decreased and glutathione increased from hearts treated with fermented non-alcoholic extract of Andean berry, in comparison to the control group (berry juice). These results indicate the ability of the extract to attenuate oxidative stress. These authors proposed from this study that Andean berry extract could be a promising therapeutic alternative against myocardial dysfunction. In addition, being a fermented extract obtained from the berry, as a source of polyphenol compounds it could ﬁnd use as a functional food to prevent diseases associated with oxidative stress. 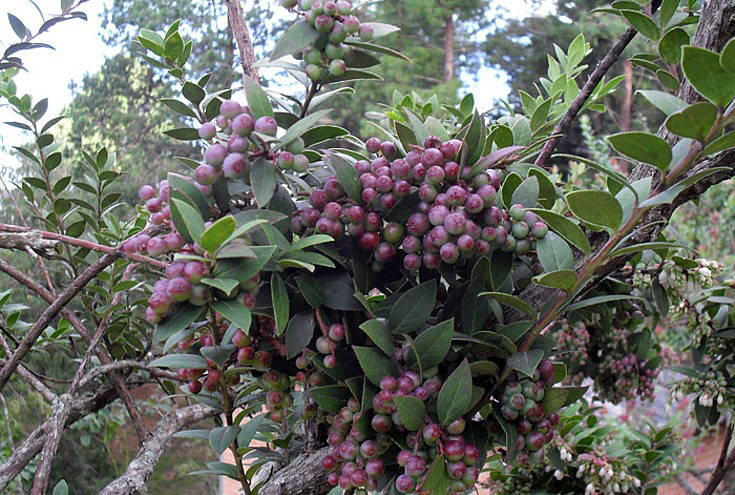 Guzmán and Cortázar evaluated the inhibitory activity of Andean berry against elastase and collagenase enzymes using an ethanol extract of the fruit or 5% glycerin as a carrier. As a source of collagenase and elastase activity, they used supernatants of human dermal ﬁbroblasts (FDHα) exposed to UVB radiation for 2 minutes at a dose of 200 mJ/cm2 with radiation intensity of 2.2 mW/cm2, and treated with the extracts for 20 minutes at an effective concentration of 1000 ppm. Guzmán and Cortázar (2011) found that the an ethanolic extract of crude Andean berry or 9.5% glycerin Andean berry extract inhibited collagenase activity present in UVB stimulated FDHα supernatants. Furthermore, the ethanol or glycerin extract inhibited 20% and 69.1% of the enzyme elastase activity under the same conditions of treatment of the cells. These researchers also tested the activity of ethanol extract with 5% glycerin from plant leaves of Andean berry, whose inhibitory activity on the enzymes collagenase and elastase was 40% and 63.5%, respectively. Based on these ﬁndings, these authors performed a qualitative assessment of the effect of a facial cosmetic formulation with leaf extract of Andean berry in volunteer women aged 35 to 45 years, twice daily for 4 weeks. They observed a signiﬁcant reduction in the appearance of wrinkles. These results were attributed to the improved solubility of secondary metabolites obtained from Andean berry leaves present in the glycerin extract. Calories 66.1 Kcal. Calories from Fat 1.8 Kcal. Calories 372.4 Kcal. Calories from Fat 42.3 Kcal.